Dr. Susan Miller’s passion is to empower women with effective compelling communication skills so they can articulate and achieve their goals, communicate their needs, and master the art of “being heard” where it counts. Be Heard the First Time is an operator’s manual for oral communication and shares the seven key skills of all competent speakers, plus Dr. Miller’s proven strategies for breath and pitch control. For beginners, she shows how to focus on posture, presence, comfort level, and the message itself. For the more skilled speaker, Dr. Miller provides effective strategies for combating dry mouth, retrieving words, and answering aggressive questioning when faced with a high-level public meeting or press conference. Be Heard the First Time promises to help reticent women walk, stand, or sit powerfully, even if you feel insecure; like the sound of your voice; breathe deeply and slowly when you are anxious; say the last word of a sentence without trailing off; express your opinions, desires, and experiences clearly; vary the loudness, pitch, and duration of your voice when speaking; entertain others with stories, presentations, and tall tales; finish your statement without interruption; interview, clarify, object, debate, and negotiate powerfully; and respond assertively to criticism. Now the soft-spoken patent attorney, for example––when promoted to the CEO position––can quickly learn how to make a confident and visible entry to a conference or reception room, and how to speak quite differently than she did before her promotion. 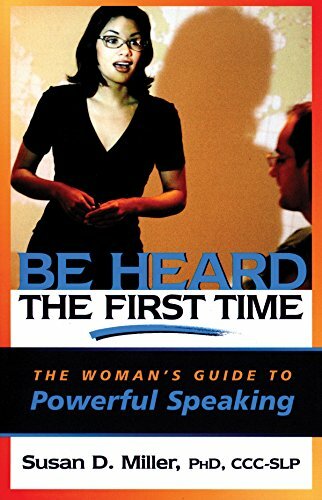 And, for those aiming for promotion, this book reveals how to “be heard the first time” so you can achieve your goals. If you have any questions about this product by Brand: Capital Books (VA), contact us by completing and submitting the form below. If you are looking for a specif part number, please include it with your message.